@Exosta Hi, I would like to buy your Sulphite Hunt in your Sulphite Hunt forum thread! Whenever you have a Niko Mission in your Map you can invite me in your Party. 🌟 You can finish your map alone, and then I enter to keep the sulphite nodes. 🌟 We can run the map together (all loot will be yours). IMPORTANT: Remember that if you are close to me when I activate the Sulphite Node, the Sulphite quantity will be split in half (you get 50% sulphite, but you will make less profit from me). If you are not interested in getting the sulphite yourself make sure to stay as far as possible from the Sulphite Node while I activate it. I will write in chat how much Sulphite I gained every time. At the end of the Map I will trade you the Chaos Orbs. 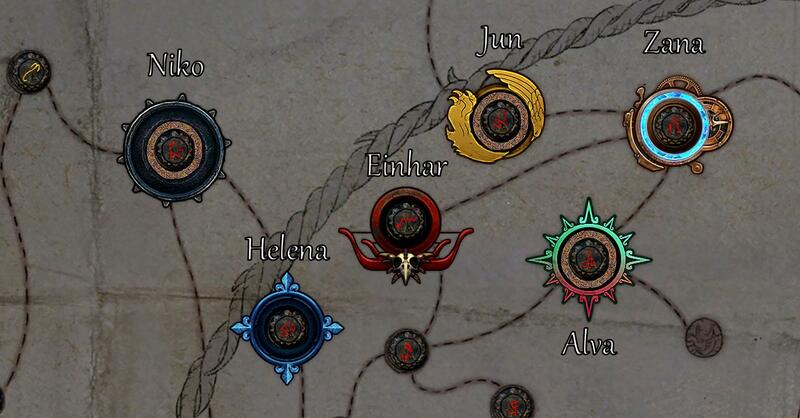 Every day, at 01:00 AM CEST Time, a daily mission for each master will spawn on your Atlas (check the following spoiler). The daily missions will spawn on the same tier of maps you usually farm. For example if you are farming T16 maps, dailies will spawn on red maps. If you can't find the daily objective on the atlas at 01:00 AM you just need to relog, and it will appear. Atlas Objectives also have a 20% chance to be generated after a map is completed. You have a 16% chance to find Niko in your maps as random encounter. A Master Seeks Help Prophecy can grant a specific Master Mission. Journeyman and Master Sextants can roll "Map contains Niko"
Sulphite Scarabs will grant Niko in your Map. Sulphite Quantity per Node is affected by Tier and Item Quantity of the Map you are running. MF does not affect Sulphite Quantity in any way. 🌟 If your Niko's daily is on a T14 Map or lower you should chisel and alchemy and use the Elder Zana Mod (15 chaos cost) from the Map Device to make the Map T16. 🌟 If your Niko's daily is on a T15-T16 Map you should chisel and roll your map until it has 95%+ quantity (more if you can afford it) and use 8% Quantity Zana Mod from the Map Device. 🌟 Put 3 Sacrifice Fragments along with the Map in your Map Device. Every Sacrifice Fragment adds 5% quantity to the Map. Mortal Fragments add 10% quantity instead and you can use them as well if you like. 🌟 Tempest Prophecies (such as "Crushing Squall", "The Undead Storm", "Fire from the Sky", "Lightning Falls", "Ice from Above") add 30% quantity to your map, and that applies to sulphite too! Try to trigger this prophecy, if you like.